IN elementary school teachers were ordered to kneel against a wall before being shot "execution-style" from behind with airsoft pellet guns during a safety drill. A representative of the state's largest teacher union testified on the matter in front of the Senate Education and Career Development Committee on Wednesday, March 20. According totheIndianapolis Star, several teachers at a time "were asked by local law enforcement to kneel down against a classroom wall before being sprayed across their backs with plastic pellets without warning". "It hurt so bad". "I was hit four times". White County Sheriff Bill Brooks told the Indy Star that the ALICE training used an airsoft gun, but the department stopped doing so recently after a teacher was upset by it. But as more and more go through active shooter training, Holub and the ISTA wants to make sure one thing doesn't happen, and that's teachers being shot at. ISTA Director of Government Relations Gail Zeheralis asked state lawmakers to add language to House Bill 1004 to prohibit such situations, according to the in newspaper. ISTA director of government relations Gail Zeheralis told lawmakers that the union wanted a statement promising that teachers wouldn't be shot with projectiles in future drills. White County Sheriff Bill Brooks confirmed to the IndyStar that his department "led the training" in January at Meadowlawn Elementary in Monticello, the newspaper reported. "It's a shooting exercise". The episode wasn't an active shooter inside of a school, and the projectiles weren't bullets. Republican state Rep. Wendy McNamara sponsored House Bill 1004, which requires that all schools have an active shooter drill once a year. Toward that end, Twin Lakes partners with the White County Sheriff's Department for public safety guidance and to train Twin Lakes staff, which includes ALICE training. 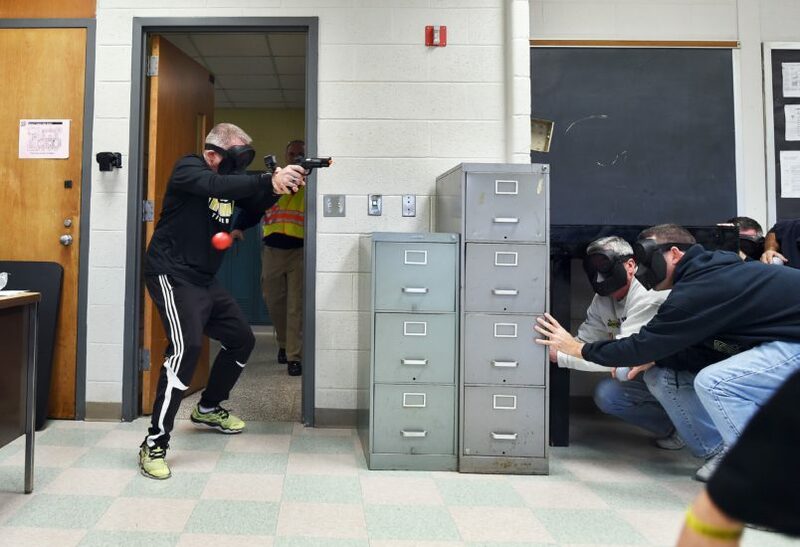 Pictured above: An "active shooter" enters a classroom as "students" take cover during ALICE (Alert, Lockdown, Inform, Counter and Evacuate) training at the Harry S. Truman High School in Levittown, Pennsylvania, on November 3, 2015. "This was the first time and hopefully last" time that law enforcement shoot at teachers as part of the training, Holub said. NFL Draft Moving from Chicago?